Opening with a rather ominous fully armoured black figure complete with shield and lance, this latest game from the top-notch WMS Gaming is all about knights of the medieval variety. Some may assume that this game is based on a historical figure, but those that have done their research ‒ or have read the tales of Arthur ‒ will know that it is highly uncertain whether such a person as the Black Knight did, in fact, exist. The Black Knight is generally associated with death and battles or trying to win the honour of a lady’s hand. Some believe he is from the Arthurian legend in which a black knight is often written about but here in this game, WMS now changes this association to one a little more pleasant, that of winning. 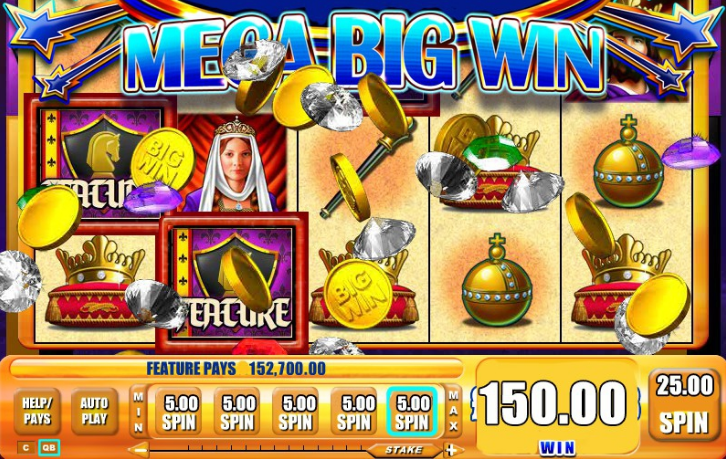 Black Knight I slot game contains five reels and a decently large thirty fixed paylines. Set against a purple sky and the silhouette of a castle, this game recalls a bygone era and one that the game requires the player to protect so that this castle does not get besieged. Whilst the graphics are a little simple compared to some of today’s games, they more than make up for this by following a kingly theme and fully recreating an Arthurian-style atmosphere. The symbols themselves are a collection of medieval artefacts including a sceptre, a globuscruciger, a map of England and France, a golden ring, and of course a majestic crown all set on a simple cream-colored background. To add to these there is a king, queen, and jester all serving to fill out positions in a royal court of old, all accompanied by relaxing ambient music reminiscent of the time period. Thank goodness that it is not Greenleeves! As with other slot games, there are a few necessary rules to cover before the intricacies of the game can be explained. A minimum of €0.30 and a maximum of €150 per spin this game can win big with a huge top prize of €10,000. There is also a decent coin range, from 0.02 up to 5 with which to play. The jackpot is, as previously mentioned, a very decent one, and even though it is not progressive it can still pay out a decent 2000 coins. A perfect game for the low risk player, this has an RTP of 96.07% making it an excellent starter game with a very nice rate of returns, though the variance can be high. It is in the special symbols that the Black Knight himself finally features within the game, taking the somewhat ominous form of the bonus symbol. There is also a Wild, which is more calmingly depicted by a large gold chess piece. 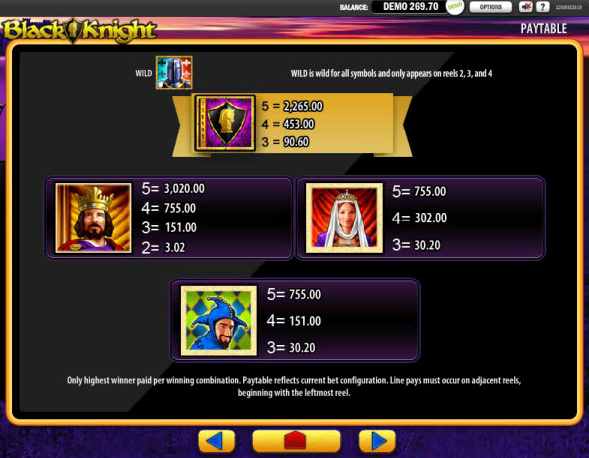 As with most slots, Black Knight I slot game features a free-spin option. Normally, in most games the Wild substitutes for the majority of the symbols in play, but does not have any impact in activating a bonus feature. This role is normally reserved for the Scatter icon, and it normally takes three of those to do so when placed from left to right on the reels. However, this is not what happens here. The Black Knight Wild substitutes for every single symbol on the reels but with one single drawback ‒ this only happens on the central three reels. 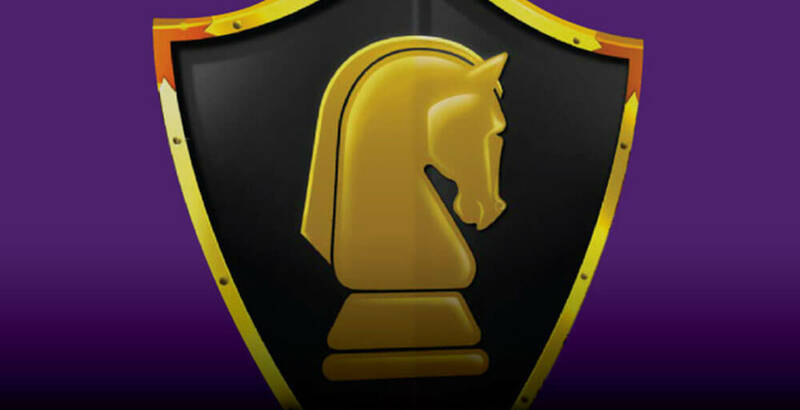 Free spins are activated when at least three of the chess piece symbols or Black Knight Wilds land on any position on the reels. This will gain the player seven free spins. In addition, the extra features of the Wild do not stop there. If a Wild appears on the reels at this phase of play, it will become expanding wilds and cover all places left on that particular reel. Not only that, but they also become Sticky Wilds and remain there, frozen for the remainder of the spins. Obviously, acquiring two or more Wilds during this time makes this a high-winning bonus round. Of course, this greatly increases potential winnings, one of the many reasons for Black Knight I to have such a high return to player rate. Sadly, there is no option to retrigger free spins but, if successful frozen Wilds come into play, the necessity or desire for re-spins is quickly nullified. Players should be wary to play carefully here though, as the temptation of that big win can make a player forget the cost per spin. Fully mobile, the Black Knight I slot game is, in fact, widely considered as being one of the best iPad games out there on today’s market. A long-time staple of land based casinos, Black Knight 1 has also been online for a number of years and this certainly shows with its mobile compatibility. It is always handy to have a game fully mobile for the player to access anytime and anywhere. In this technological era, accessibility is a must for games to succeed. This is a simple little slot with a rather basic game play, not so many flashy features in the graphics and animation department, but this only really serves to help recreate the old-style feel of the game as a whole. However, its nifty game play and easy winning options continue to make this game a success with beginners and experts alike. For those that are new, this is an easy way to break into the gaming world and for those that aren’t, well this makes for a nice relaxing break from some of the more hectic games out there and provides a fair amount of very decent wins. Whilst the bonuses are where the big money can lie ‒ especially if you get some early Wilds on the free spins ‒ there are plenty of excellent opportunities throughout that will provide a win. With a relatively high variance though, there will be days with lower winnings than others.